A cold front sweeps across New England today, triggering scattered showers and thunderstorms across the region. Mostly sunny. Highs near 80. A cold front is sweeping across New England on Wednesday, triggering scattered showers and thunderstorms across the region. A cool, comfortable and dry night is on tap with lows dipping into the mid to upper 50s. High pressure slides overhead on Thursday, resulting in a pleasant mid-June day with sun and highs in the low 80s south, upper 70s north. A warm front traverses north across New England on Friday, ushering much more humid air back into the region ahead of an approaching area of low pressure located across the Great Lakes. Expecting increasing clouds and showers on Friday with highs reaching into the mid 80s. Dew points rise back into the upper 60s to 70 degrees. As we look ahead to the weekend, remnants from Tropical Storm Cindy will gradually make its way north into our area. 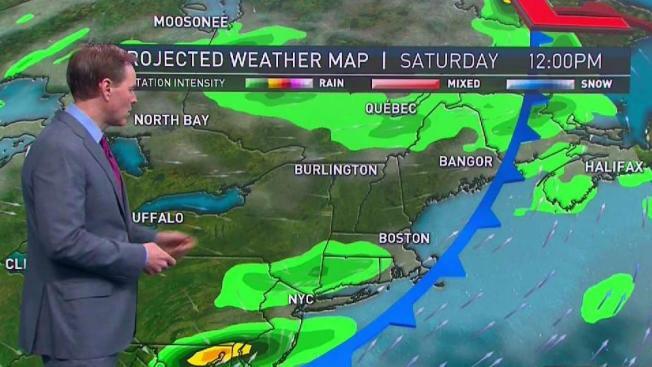 On Saturday, a cold front will push across New England. Overall trend is for clouds to break and humidity to wane. Highs reach into the low to mid 80s. Expecting mostly sunny skies on Sunday with seasonably-warm temperatures and comfortable humidity levels. A cooling trend at the beginning of next week will cause temperatures to drop, with highs on Monday and Tuesday falling back a bit into the mid to upper 70s.